The second Eurochestries Festival in China is offering a truly international experience, as 500 musicians from 9 orchestras in 15 countries take to the stage, Chen Nan reports. 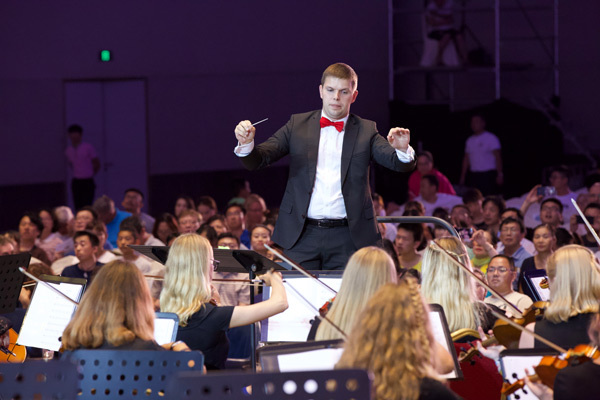 The Eurochestries Festival is returning to Qingdao, East China's Shandong province, for the second year in a row, as it aims to promote orchestral practice among musicians aged 15 to 25. Founded in 1989 by French composer and chorus conductor Marcel Corneloup to encourage international music exchanges, the program first came to the Chinese coastal city last summer. This year's event, which runs through Saturday, has attracted over 500 musicians from nine orchestras in 15 countries, to stage a total of 14 concerts at different venues in Qingdao. The festival opened at the Mangrove Tree Convention and Exhibition Center on Aug 3 with performances by Spain's orchestra Jerez Alvarez Beigbeder performing The Barber of Seville Overture by Italian composer Gioachino Rossini, and the Ritual Fire Dance by Spanish composer Manuel de Falla-led by conductor and vice-president of the festival, Angel Luis Perez Garrido. Other highlights at the opening ceremony included French symphony orchestra Cote d'Opale's overture to Jacques Offenbach's Orpheus in the Underworld, and Estonia's Symphony Orchestra of the Nomme Music School performing Eduard Tubin's Dance Suite on Estonian Themes. The event will close with a concert featuring seven symphony orchestras, including Norway's Bergen Philharmonic Youth Orchestra and the Strasbourg de France Youth Orchestra. The second Eurochestries Festival in China is offering a truly international experience, as 500 musicians from 9 orchestras in 15 countries take to the stage.